At the on-going Computex convention, Acer has unveiled its new Liquid E Ferrari Edition smartphone.This limited edition mobile comes in bright red and is powered with a Qualcomm 8520 processor running at 768 MHz. 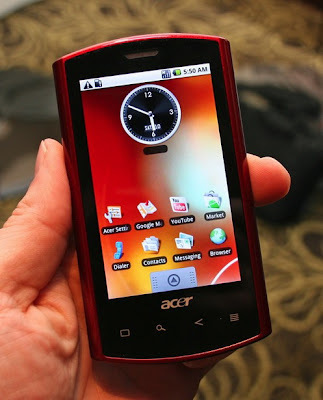 It has a scarlet colored mobile front, flaunts a 3.5 inch hi-resolution capacitive touch screen, which runs on the Google Android 2.1 Eclair operating system. The Liquid E Ferrari consists of five homescreens and is already per-loaded with Ferrari images, car themed ringtones and videos. The Facebook and Twitter apps also feature in it. The Liquid E Ferrari consists of a 5 mega pixel camera with auto focus, a 512 MB RAM, external memory expandable to 16 GB and 3.5 mm audio jack. The connectivity feature of this mobile includes geotagging features, WiFi, A-GPS, Bluetooth and a mini USB. All these features connect to your 3G HSDPA network. The battery offers a talk time five hours and a stand by for 400 hours. The actual date for the launch of the product and the price tag has not been disclosed yet. 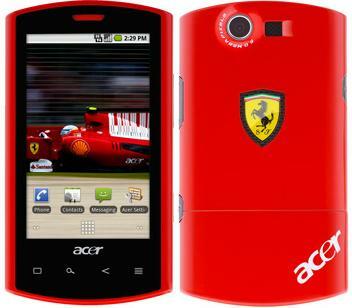 Tags: Acer Liquid E Ferrari, Acer Liquid E Ferrari review, Acer Liquid E Ferrari multimedia features, Acer Liquid E Ferrari features, Acer Liquid E Ferrari details, Acer Liquid E Ferrari specifications, Acer Liquid E Ferrari information, Acer Liquid E Ferrari images, Acer Liquid E Ferrari pics, Acer Liquid E Ferrari pictures, Acer Liquid E Ferrari hardware features, Acer Liquid E Ferrari software features, Acer Liquid E Ferrari application features, Acer Liquid E Ferrari availability, Acer Liquid E Ferrari price.